The Himalaya are experiencing the most drastic global climate change outside of the poles with predicted temperature increases of 5-6oC, 20-30% increase in rainfall, and rapid melting of permanent snows and glaciers. We have established a 1500km trans-Himalayan transect in Tibetan China, Bhutan and Nepal to document the affects of climate change on alpine plants and peoples (Figure 1). Initial data show that Himalayan alpine plants respond to environmental variables including elevation, precipitation, and biogeography and that people use these plants as medicines and for yak grazing. 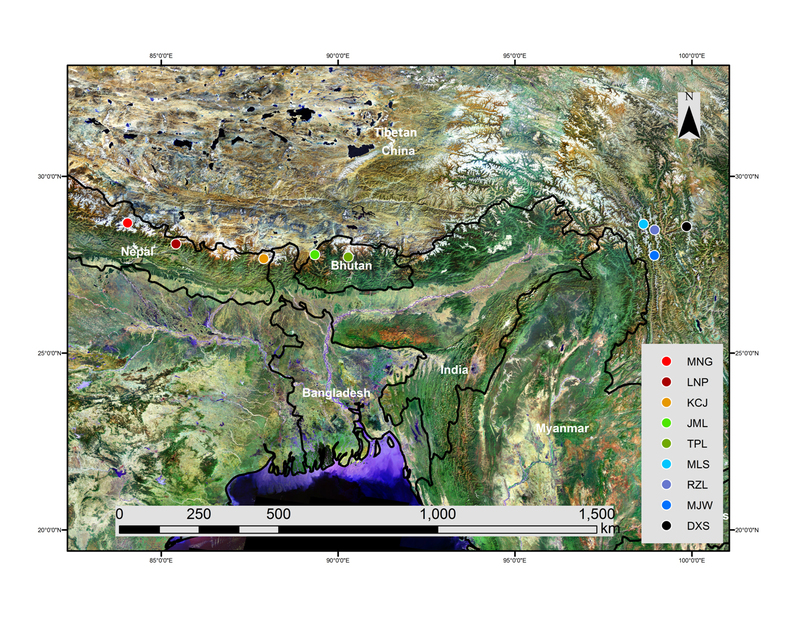 Since climate change is expected to majorly affect both precipitation and temperature (for which elevation is a proxy), we anticipate great changes in Himalayan alpine vegetation as we begin re-monitoring our long-term sampling sites in 2012 – seven years after the initial site was established. GLORIA protocol (www.gloria.ac.at) prescribes four summits at each major site ("target area") chosen along an elevational gradient between treeline and permanent snowline to represent four ecotones: subalpine-lower alpine, lower alpine-upper alpine, upper alpine-subnival, and subnival-nival. Each summit is divided into 8 sections facing the cardinal directions (N, S, E, W) with 4 sections ranging from the summit down 5m in vertical elevation and another 4 sections ranging from 5m to 10m vertical elevation. Within summit sections, all species and their relative abundance are recorded. Additionally, at 5m vertical distance below the highest summit point in each of the 4 cardinal directions, a 3x3m grid is laid. In the 4 corner, 1x1m quadrats, all species are recorded as well as their frequency and percent cover. Soil temperature data are collected from buried wireless mini data loggers (Geo Precision M-Log5W) in the center of the 3x3m grids. Our study sites (Figure 1) span across 1500km from the Hengduan Mountains of NW Yunnan, China in the east to western Nepal near Mt Annapurna. At each major site are 3-4 summits inventoried for plant species, frequencies, cover and relative abundance at elevations, latitudes and longitudes as listed on the study site page. Alpine plants are identified both in the field and confirmed with vouchers deposited at the Missouri Botanical Garden and national/local herbaria including the Shangri-La Alpine Botanical Garden (SABG), NW Yunnan, China; Kunming Institute of Botany (KUN), Yunnan, China; the national herbarium at the National Biodiversity Centre (THIM), Thimphu, Bhutan; and Tribhuvan University Herbarium (TUCH), Kathmandu, Nepal. These vouchers can be referenced here.